This table top bain marie is perfect for keeping your foods warm for your buffet line or party. Also use to melt chocolate, to make delicate cream sauces, white sauces and to cook eggs and other foods. The water will shield your ingredients from direct heat so the food doesn't scorch, curdle, or burn. This method of cooking surrounds the food with very gentle heat. Great for caterers, restaurants, cafes, diners, food trucks, concessions stands, lobbies and more. Sixe: 23" x 15" x 9"
Dimensions: 27" x 23" x 9"
Keeps Food at proper serving temperatures without drying it out. Now NSF certified as warmer/cooker! Ez drain front spigot folds in. Mirror polished heavy duty 18/8 stainless steel body for long life. 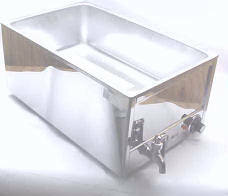 Standard 12"x20" well opening accepts most popular warmer pans. Voltage: AC 120V, 60 HZ, with 65 " cord & 3-prong grounded plug. Well Capacity: 3.5 quarts hot water. Heavy Duty Spoon for mixing or soups. 21 inches long. Get all the goodies without all the juice. 21 inches long. Handle measures qapprox. 14". Bowl of ladle measures 6.5" in diameter. Handle measures 12" long and diameter of bowl is 5". High durability fiberglass tray with molded in non-slip surface. The non-slip layer resists peeling at the edges for long lasting use. Not recommended to be soaked in hot water. This 3 gallon round tea dispenser is an easy-to-maintain drink dispenser that's perfect for a self-service beverage counter. The stainless steel construction on this tea urn makes it durable and easy to clean. The "No Drip" faucet helps keep the serving station clean by preventing drips and spillage. Stainless steel handles are positioned on this round dispenser for added comfort when lifting and easy transportation. This tea dispenser features a black plastic lid and an "Iced Tea" graphic (included, but not installed). Great for restaurants, cafes, concession stands, snack bars, food trucks or grills or even your next party. This 5 gallon round tea dispenser is an easy-to-maintain dispenser that's perfect for a self-service beverage counter. The stainless steel construction on this tea urn makes it durable and easy to clean. The "No Drip" faucet helps keep the serving station clean by preventing drips and spillage. Stainless steel handles are positioned on this round dispenser for added comfort when lifting and easy transportation. This tea dispenser features a black plastic lid and an "Iced Tea" graphic (included, but not installed). Large capacity dispenser perfect for restaurants, cafes, concession stands, snack bars, food trucks or grills or even your next party. This 5 gallon slim tea dispenser is an easy-to-maintain dispenser that's perfect for a self-service beverage counter and so much more. With the slim design on this beverage dispenser, it's perfect for any counter that is limited on space. The stainless steel construction on this tea urn makes it durable and easy to clean. The "No Drip" faucet helps keep the serving station clean by preventing drips and spillage. This tea dispenser features a black plastic lid. Save space with this slim line dispenser great for catering, restaurants, snack bars, food trucks or grills or even your next party. 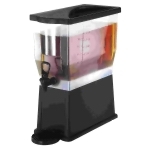 This black, 3 gallon beverage dispenser is ideal for serving drinks like iced tea, lemonade, and more at your restaurant, food truck or catering event. This dispenser is BPA-free and features half gallon graduations molded onto the side of the reservoir. The included drip tray prevents the dispenser from spilling contents onto the countertop, promoting a clean environment. 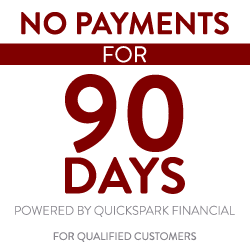 Dispensing is made easy with a reliable faucet. Use this plastic drink dispenser at self-service stations in restaurants or at catering events like meetings, parties, banquets, and more. 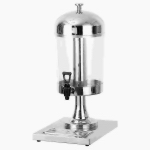 This sleek 8 liter, single bowl beverage dispenser will accentuate any beverage station at a catering event plus much more. Clear walls allow contents to be attractively displayed and viewed for easy identification. This one-bowl juice dispenser features an ice tube to keep beverage contents chilled without watering down your beverage, and the drip tray promotes mess-free counter space. Constructed of stainless steel and durable plastic, this dispenser is great for frequent, long-lasting use. Perfect for restaurants, snack bars, food trucks or concession stands or even your next party. This coffee urn is a large capacity coffee maker that is the perfect addition to any area where large amounts of coffee are consumed. This coffee maker brews perfect coffee at a cup per minute speed and can keep the coffee hot for hours. A "serve" light indicates completion of the coffee maker's automatic brewing cycle. Made of highly polished aluminum construction for easy handling and durability. Perfect for your restaurant, grill or food truck. This coffee urn is a jumbo sized capacity coffee maker that is the perfect addition to any area where large amounts of coffee are consumed. This coffee maker brews perfect coffee at a cup per minute speed and can keep the coffee hot for hours. A "serve" light indicates completion of the coffee maker's automatic brewing cycle. Made of highly polished aluminum construction for easy handling and durability. Perfect for your restaurant, grill or food truck. 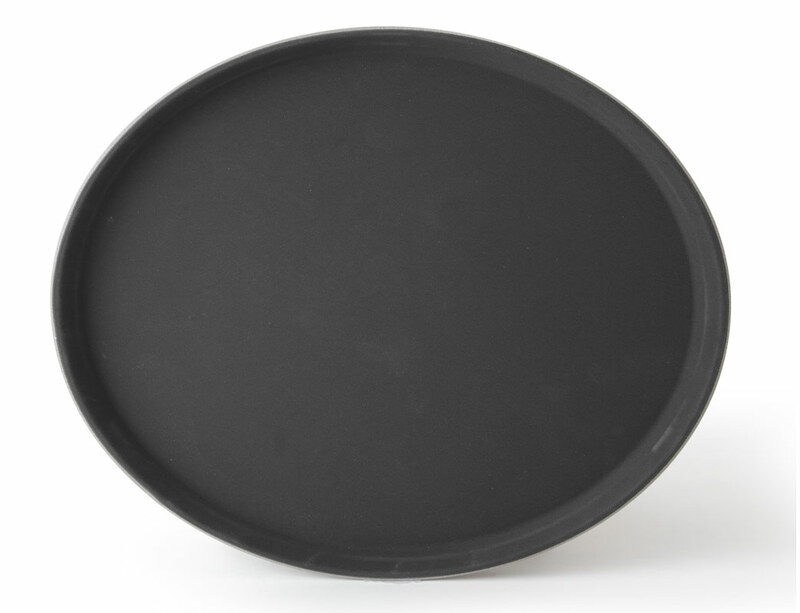 Place a filled decanter on this single warming plate to keep your pot of coffee hot. It's the perfect warmer for any beverage service operation that requires one pot of coffee to be warm and ready-to-serve at all times. 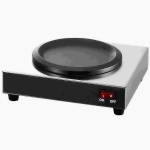 Featuring a stainless steel body and a non-stick coated warming plate, this single coffee warmer is durable and easy to clean. It is ideal for diners, food trucks, buffet lines, conference rooms, break rooms, and more. Serve warm beverages to your guests with this 1.5 liter stainless steel coffee server. Double-walled, this insulated carafe can retain heat for hours. 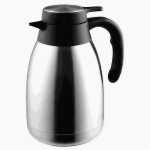 The ergonomic handle and push button lid provide added convenience to this versatile pitcher, making it easy to serve guests quickly and efficiently. A durable addition to any beverage station, this coffee decanter has a 201 stainless steel exterior and interior liner. The stainless exterior of this commercial-grade coffee server also features a satin-finish while the black plastic lid is trimmed in stainless steel. The result is an attractive black and silver look that will fit in nearly any setting. This coffee server is perfect for diners, food trucks, cafes, convenience stores, offices, and more. 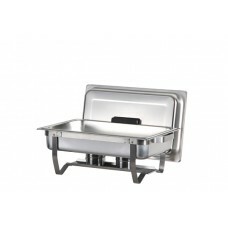 This chafing dish is made of stainless steel. Comes with folding stand so you can just fold it up and store it when your not using it. Has heat resistant handle so it will not get hot for you or your patrons.Will hold a full size 4 inch deep pan. This chafing dish is made of stainless steel. The cover and base of this dry food dispenser are made from stainless steel. The transparent plastic container has a 7.5 liter capacity. It is ideal for holding and displaying cereal, candy, trail mix, nuts, beans, coffee, and a variety of other dry foods. An easy turn knob on the countertop dispenser lets users effortlessly dispense a fixed amount of food with each turn, effectively helping control portion size and minimize waste and mess. Perfect for hotels, university dining facilities, catering operations, buffets, grocery stores, and more.